TouchCopy provides a large amount of flexibility in its operation. Use TouchCopy Options to customise TouchCopy to your needs. PC - TouchCopy Options are displayed by clicking "Options" in the TouchCopy tool bar. The Tabs in the Options window separate the areas of functionality to be modified. Here you can customise the folder and file structure of your copied music data. 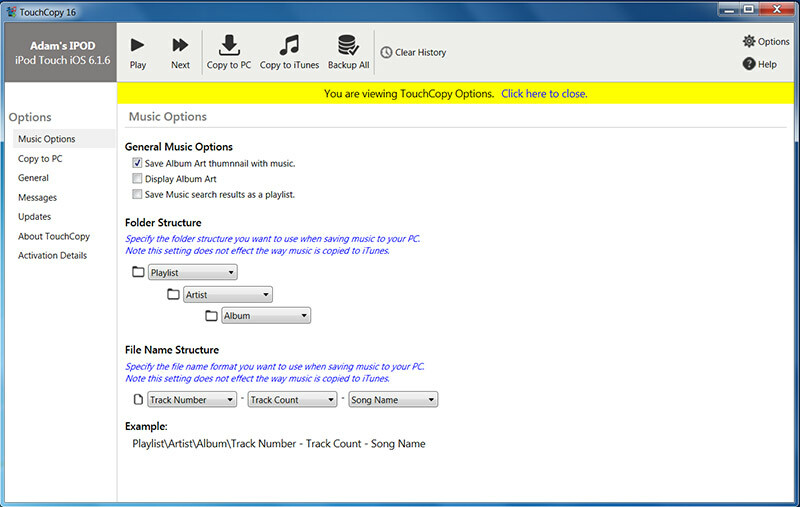 From General Music Options, you can also set whether TouchCopy will save and display album art for your music. Setting the folder to which your device's content should be saved to; deciding whether TouchCopy should Copy and Replace existing files with the same name and deciding how the files and folder should be named. PC has an extra option, where you can define whether an album art thumbnail should be saved with the music. Mac has two extra options, and in these you can define whether messages are shown to select save location before copying, and whether a message is shown when all the copying has been completed. In this tab, you can select from a few general options, such as setting TouchCopy to check for updates, to display a confirmation message when a copy is complete, and wether you would like TouchCopy to eject iPods on closing the TouchCopy application. This tab simply provides the user the ability to limit the amount of Messages displayed in the message preview. Choosing this tab will automatically check for any available updates for TouchCopy. In this section, details are displayed about what version of TouchCopy is running, as well as a link to the Wide Angle Software website. This tab provides users information about their specific activation details. TouchCopy activation code, registered email, activation date and expiration date are displayed for the users convenience. If you have not yet activated your software, this tab will enable you to enter your activation code and create a password. Once these details have been entered, the user will have access to the full, unrestricted version of TouchCopy.